You ladies have been very sweet complimenting my hair recently... can't get anything past you guys! My secret? I recently had my first blow out & it changed my life. Ok, so maybe I am exaggerating a little bit, but seriously, I am a changed woman. I am one of those people that you might hate... my hair holds style for dayssss & yet I am still too lazy to fix it, even one or two times a week. After I realized that with a blow out I could easily rock flawless hair for three days, I knew that I had to figure out how to do it on my own without dishing out $50 a pop. The tricks of my trade? Have any of you tried an at home blow out? P.P.S Like Misikko on Facebook for more hair advice & product giveaways! 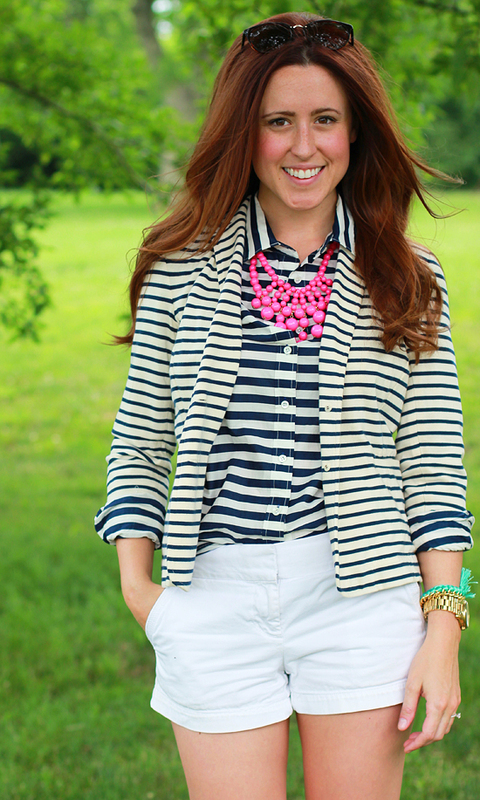 super cute love the stripes on stripes combo! your hair does look awesome! I can't do the whole round brush blowout for the life of me, so I substitute by using a 2" curling iron. It gives your hair body and a slight wave and looks exactly like a blowout! Your hair looks gorgeous! Great job on doing it yourself. I struggle with doing my own blowout. Most of the time it gets ruined by the humidity, so I don't try!! Super cute, I love the double stripes with a pop of pink! I used to do a blow out on my hair about once a week, but I've gotten lazy this summer! you hair looks extra voluminous here, so clearly the tools did a great job! You are the cutest! I love the stripes-on-stripes, and your hair looks extra fab here! your hair does look really great! :) love your stripes on stripes and pink necklace. Your hair looks amazing heere and I LOVE the stripes on stripes! I'm wearing that same necklace today but in mint! I am SO jealous that your hair can stay like that for days. I have to wash/style my hair daily or it looks gross. I love stripes on stripes, it's one of my favs! Totally loving the stripes on stripes. You are gorgeous my friend! Loving the stripes on stripes, Jessica! You look amazing in these photos! Great combo! And your hair looks fab!!! Your hair looks fabulous. Just gorg! 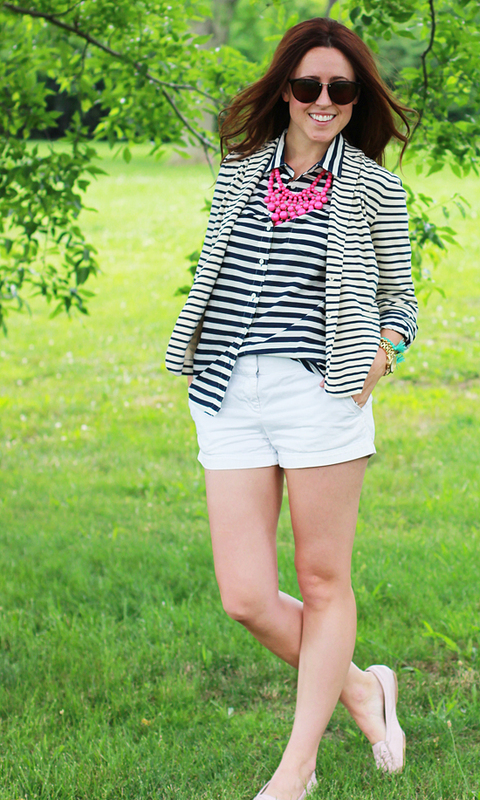 I love the stripes on stripes, especially with the statement necklace. Love it! I'm loving the stripes on stripes look! Super cute. And your hair looks lovely too. Stripes on stripes looks much better than I thought it would! I'll need to try it! Ooo girl, your hair does look good!!! I love it.. I've never done a blowout, but I think my hair's too short for it anyway. Love the stripes on stripes, you put this together so well! The statement necklaces adds the perfect pop of color! You are working the strips doll! you're too cute, i can't take it! love this look! I love when you lovely bloggers wear patterns on patterns and pull them off so wonderfully! I absolutely LOVE how you paired stripes but kept both pieces in the same colors. It adds so much interest to your outfit without being over the top. Love, Love, Love! Love how full your hair looks! I just recently discovered dry shampoo & stopped washing my hair every day. I really like how the curls stays when i use a curling iron on my dirty hair days. Love your doubled up stripes! And I love that we both wore our pink baubles with stripes! So fun! On another note, I'm with you on the hair thing...I really try to make my blowouts last as long as possible but am a little weird about going too long. I've seen blog posts on going 2 weeks between blowouts?! So cray! You look so fresh in these pictures...is that weird to say?? Seriously loving this look and your hair!!! I wish I had half of it...high five with the stripes on stripes! You totally rock the stripes on stripes. I feel like navy and white striped outfits are the best kind...but then again, I could just be feeling 'Merican because of the holidays. Oh well, love it regardless! I love everything about this outfit. Especially the POP of pink :) Hope you're having a great weekend! Beautiful necklace! Great pop of color! your hair does look amazing! and yes, I do hate you for having perfect hair that does what you want! And the double stripes are great with the pop of pink!